The Swindon Bowls Club Floodlit Gala 2016 took place between the 19th and 23rd September and what an incredible tournament it was. Apart from the first day, the weather was perfect and all players enjoyed some very mild conditions under the floodlights. 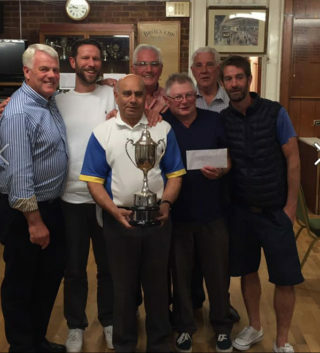 The Finals day was a fantastic competition with two great semi-finals, followed by a really close final between a Swindon Bowls Club team and Rodbourne Cheney, with Swindon turning out the eventual winners. Congratulations go to Dean Draper, Mickey Pearce, Steve Barker and Carl Fernandes for some outstanding bowling. A huge vote of thanks must also go to everyone who contributed in some way to the running of the event. In particular, Jim O’Leary for being the event organiser, Chris O’Leary for selling raffle tickets etc, the ladies in the kitchen for providing superb food at the end of every game and to all those members that helped lay out the rinks every day. Roll on 2017.